On Saturday October 18th the South County Search and Rescue (SAR) Command Center, located at the Lone Pine Airport, was officially unveiled and dedicated to soon-to-be-retired Undersheriff, and longtime SAR Commander, Keith Hardcastle. The building once served as a Forest Service helicopter base center. When the Forest Service transferred their operations to the Independence airport, the building was used mainly as storage. About six months ago the Inyo County Sheriff’s Office acquired the badly damaged building, and with the help from inmate labor and volunteer SAR members transformed the dilapidated building into a functional command center for south-county SAR operations. 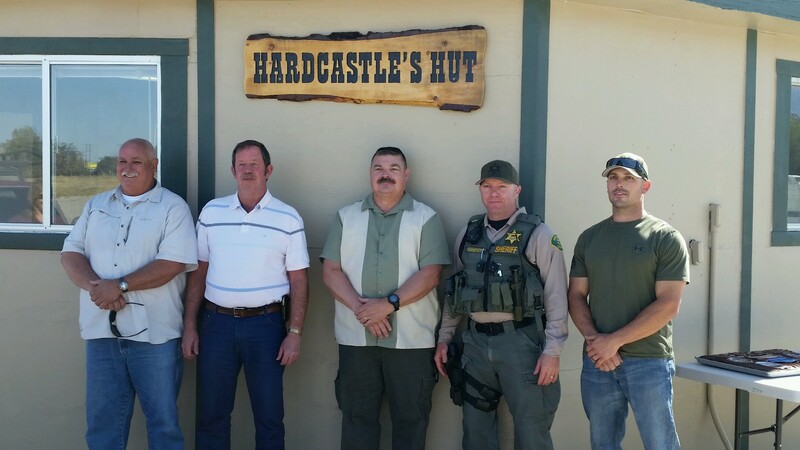 Undersheriff Keith Hardcastle began his career in 1985 as an Inyo County Sheriff’s Deputy; he has been a SAR Coordinator since 1994. “When I began as a Coordinator for SAR it was a different era – there were no cell phones, no on-the-fly mapping technology; map and compass was how we got the job done,” said Hardcastle.